As noted by others there are add ons for wifi devices, cable, laundry but I only elected to get cable at @$2 more. Verizon worked well for cell service as well as wifi. With GS discount it still was a reasonable $37 plus tax CAD. Nice park but very few campers so had lots of space between units. We will stay here again. We camped at Dave's RV Park and Campground in a Motorhome. Stopped here for one night. Reservation and check-in was very friendly. Found the park layout very easy to navigate. We had a large pull-through that was easy in, easy out. Level gravel. Good value for money. Would definitely stay here again. Did not use WiFi, I believe it was extra if needed. We camped at Dave's RV Park and Campground in a Motorhome. I see lots of whining about the cost but if you don't need the services you don't pay for them. We are in a 40' big rig with all the amenities. We don't use toilets or showers or laundry. You get what you pay for. I get internet through my phone and It works great here. This is a great camp and it is well kept. Nice spacious sites. Easy access pull throughs and friendly owners. I recommend it. We camped at Dave's RV Park and Campground in a Motorhome. Love this quiet campground! There are pull thru sites as well as back-ins. We had full hook up on hard packed gravel, level, grass and picnic table. Not too close to neighbors. Excellent washers and dryers. Some of the cleanest showers and bathrooms we have seen. Manicured lawns and gardens. An elderly couple own and operate this facility by themselves. The woman brought us apple squares made from her fruit trees and even found my lost earring while cleaning under the washing machine with a Swiffer! 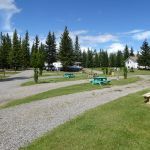 Highly recommend for quiet, cleanliness, beautiful surroundings, and convenience to Vanderhoof for errands and necessities. We camped at Dave's RV Park and Campground in a Motorhome. Owners live in house on premise, very nice when checked in. As other reviewer said, some sites are a little narrow, but for overnighter, is just fine. Park is very nice. has a nice garden area with a large checkerboard to play. Nice flowers and seating area. Did not see until we were leaving. Wish had seen last night and would have sat out there and enjoyed the evening. The only thing I really did not care for but did use was the wifi. We had to pay $3.00 per device to use wifi. So that was $6.00 more to our nightly rate. In addition, $2.00 for 50amp service. I don't feel we got $6.00 worth for the wifi for one night but that was the only way we could get it for each of our devices. You could not move the code from your laptop to your iPad either. We camped at Dave's RV Park and Campground in a Motorhome. This was a very nice park with large pull-through sites. The owner was very nice and helpful. They had very nice rest rooms, showers, and laundry facilities. They charged a flat fee per load of laundry which was very convenient not to have to deal with change for the machines. We camped at Dave's RV Park and Campground in a Motorhome. This is a great place to stay for a couple of days. The pride and care of the campground and the owners personal home shows. They have a beautiful flower garden with winding path through it with plaques explaining the names of the flowers. Everything is kept clean and in working order. The sites are a good width and length with grass, picnic table on nice patio. Wi-Fi worked good, so didn't mind being charged a daily fee. Many TV channels were available, also for an extra fee. Owner stopped by before we left and said "We have some of the nicest people stay in our backyard". Would definitely stay again if in the area. We camped at Dave's RV Park and Campground in a Motorhome. This is a very nice and quiet park. Laundry is $4.50 to wash and dry a load. Huge laundry and shower facility and very nicely kept. Restrooms and showers are each private and separate from each other. Would definitely stay here again. We camped at Dave's RV Park and Campground in a Motorhome. This may have been the nicest RV park I have stayed in since I started the Canada/Alaska adventure. It is well kept with a strict attention to detail. The owner lives on site in a nice house, and this park is like his well kept back yard. The previous poster was right about the tiered pricing. I didn't need the WiFi or cable, or 50 amp, so I paid less. Good space between the sites. I would stay here again. We camped at Dave's RV Park and Campground in a Motorhome. Clean, tidy campground. Price reflects extra for cable TV and Wi-Fi. Easy access from road and into sites. Would probably stay here again. We camped at Dave's RV Park and Campground in a Motorhome. Clean, well laid out and everything works. Wi-Fi is available but is not included in the price. Very nice and we would definitely stay here again. We camped at Dave's RV Park and Campground in a Motorhome. This is one of the nicest and cleanest parks we have been in since returning from Alaska. The grounds are meticulously maintained and the sites are level even though on a slope offering views above nearby coaches. Some of the amenities are extra such as Wi-Fi and 50amp, but as least are available at all sites. You pay for what you want. I would go out of my way to stay here again! We camped at Dave's RV Park and Campground in a Motorhome.